Aunt Pam's Downsizing & P&J Sales Has Joined Forces for even better service!! We help with the physical and often emotional aspects of downsizing for older adults and those going through life changes, such as divorce, the passing of a loved one, moving or just overwhelmed by clutter. APD can help you sort through your things and decide what to keep, what may be sold and what to donate to non profits and local organizations and community groups that NEED them. For items that can be sold, we facilitate the selling with online auctions and estate sales as well as themed events. Online, we use only highly experienced top rated plus sellers, who carefully research items to help them sell for the best prices possible and the same care is taken for our estate and other sales. NEW SALE! LIVE SALE - 1 day only. Sunday, September 9th. 11:00 am - 4:00 pm. EVERYTHING in the house is for sale. Furniture, decor, tools, and more. Barness Drive in Warminster (look for P&J Sales signs). West Chester, PA Sale By Appointment Only Saturday July 14th TIME CHANGE!!! Home Content Sale 9/22 9-2 pm ONE DAY ONLY!!! Home Content Sale 8/26 9-1 ONE DAY ONLY!!! Lilly Pulitzer Sale!! NOW LIVE!! Tons of New & Gently Owned LILLY Items. College Clean Out Sale - TRASH 2 TREASURE MEGA SALE!!! 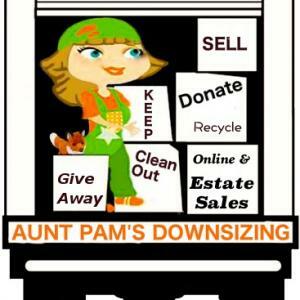 Aunt Pam's Downsizing takes the time to understand your needs, expertly sorts your stuff and manage your items with care to ensure they get into the hands of those who need them and will love them as much as you once did. "Pam is amazing to work with. Her integrity and compassion for her clients really comes through in all she does. Downsizing can be difficult, and Pam is able to help people release their attachment to "stuff" in a wonderful way!" Pam has been an enormous help to our family, I am so grateful that we found her. She devoted great time and attention to researching and posting the variety of items we hoped to sell. She was enthusiastic and willing to dive into anything, from collectible dolls, rock and roll memorabilia to antique kitchen tools. I highly recommend her services, you won't be disappointed. Pam is amazing, thorough, professional, and awesome. She handles the art of selling on eBay masterfully. If it were not for her, we would have thrown away many items from our mother's estate, but Pam took over and saved us. She is an expert seller, honest, friendly, and fun. Highly recommend!